Flamenco drawing - very good music and drawing!!!! Thanks! I feel that the nature of Flamenco itself is very expressive, so it is very interesting to use that as an advantage to paint a nice picture! very nice flamenco painting, lovely angle/position...well done..I have a spanish friend who comes from La Coruna,I will have to show her this! I can feel the music in it! Bravo! Thanks! that was one of the aims, I am glad you like it! I am in love with this! Amazing! thanks so much! your pictures are super nice too! do you like Flamenco? 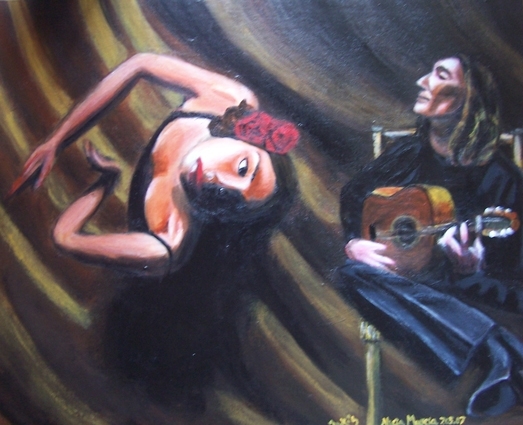 i have plenty of paintings inspired by Flamenco, so passionated, i love it! I hvent really tought about it, I only know i really really love ure work! thanks so much!! much more to come about Flamenco soon, i m organising an exhibition in May! Oh cooool.... what is an exhibition? a painting exhibition, where you can display your work! Ah oki! I didnt understod the word. But thats awesome!!! Good for U!!! thanks so much!! i do appreciate! !